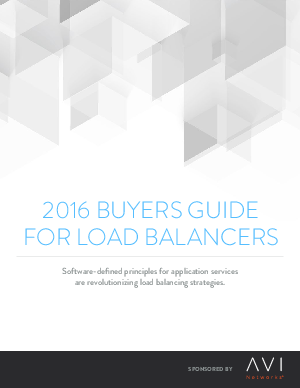 This buyer’s guide for load balancers is based on research, best practices, and conversations with network administrators and IT operations teams at over 110 Global 2000 enterprises. It presents guidelines for choosing application services that mirror the needs of modern data centers and public cloud initiatives. The guide is organized in sections, starting with a pre-assessment of your current application delivery capabilities. With data gathered from your pre-assessment, you can review the considerations involved in creating a software-defined application services strategy; identify opportunities to improve automation of application services and operations. Finally, use the software-defined application services checklist at the end of the guide to identify key priorities in your choice of application service solutions for your enterprise.